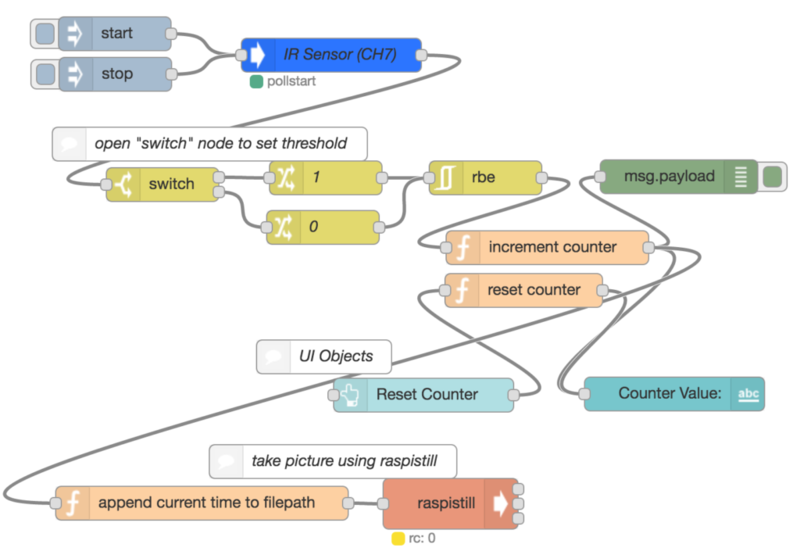 If you have your own IR sensor, you can connect it to the PiShield using the sensor pinout here. For the optional camera component, you may have to position the Raspberry Pi close to where the camera needs to be mounted (as the camera cable is quite short), and use a extension cable for the IR sensor. Below is the node-red flow. The full that you can copy+paste into node-red is here. The top left is the familiar sensor node that grabs analog data from the sensor (in this case connected to the last port on the PiShield). From there we do some basic thresholding inside the “switch” node, and then output either a 1 or 0 depending on the sensor level. The rbe node filters out repeated values and only emits changes, which then is used in the “increment counter” function. 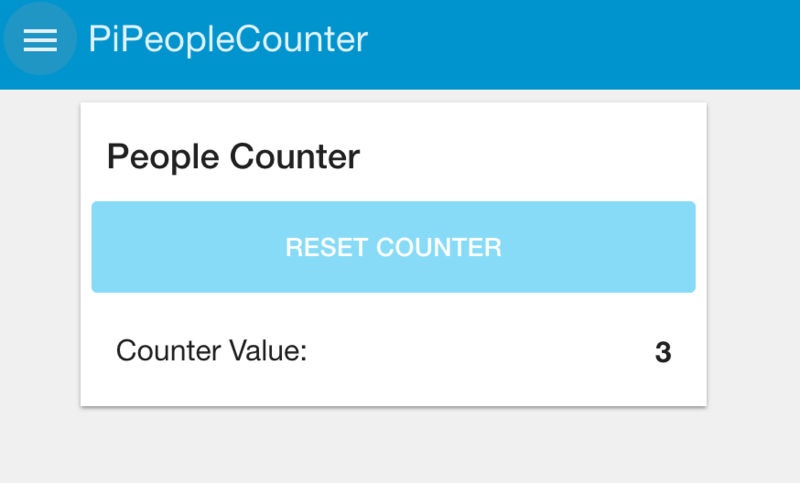 The UI text node in cyan show the counter value, and provides a button for resetting the counter. Finally, at the bottom, there is the optional part that triggers raspistill to take a picture. The function node at the bottom grabs the current time and uses it for the filename. We assume that the images will be placed in /home/pi/camera, but feel free to change that to somewhere else if you like. The external utility (raspistill) is triggered via an exec node, shown in red. Instead of raspistill, you can also use raspivid to take videos instead. With some adaptation, you could turn this into an interactive photo or video booth as well. For the movement events, it would also be possible to send remote triggers (e.g. IFTTT, MQTT, etc). 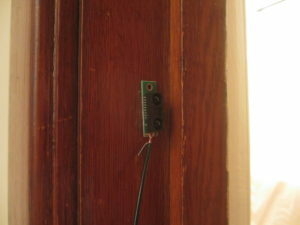 You could also add additional sensors to detect other kinds of motion (e.g. TapTile floor sensors for detecting steps, or the MoveOn for presence in a room, etc).